HANOI, March 31 (Xinhua) -- China and Laos pledged here Saturday to strive for more achievements in the Lancang-Mekong Cooperation (LMC). The pledge was made at a meeting between Chinese State Councilor and Foreign Minister Wang Yi and Lao Prime Minister Thongloun Sisoulith. Wang said the Chinese and Lao leaders have reached important consensus on jointly building a community of shared future with strategic significance, charting the course for the future development of China-Laos relations. He called for well planning and carrying out high-level exchanges and comprehensively advancing practical cooperation between the two countries. He said China-Laos railway is a flagship project of the bilateral cooperation and also a concrete outcome of the dovetailing of the development strategies between China and its neighboring countries under the framework of China's Belt and Road Initiative. Wang hoped that the two countries strengthen planning and coordinating on the project and ensure its smooth progress. As co-chairs of the LMC, Wang said China stands ready to work with Laos for greater achievements of the LMC. 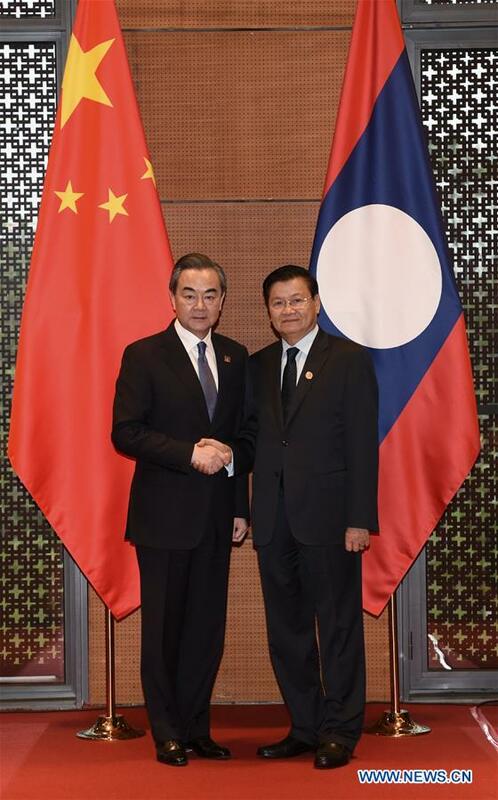 Wang believed that Laos, an important member of the Association of Southeast Asian Nations (ASEAN), will continue to play a positive role in the development of the China-ASEAN relations. Thongloun, for his part, said Laos and China have witnessed important progress in their pragmatic cooperation since last year. The project of the China-Laos railway, in particular, has been progressing smoothly and the Lao people have been enjoying substantial benefits from the joint development of the Belt and Road Initiative, he noted. Laos is ready to maintain close high-level exchanges with China and continue to further cooperation in regional connectivity, he said. As Laos co-chairs the LMC with China, Thongloun said his country is willing to cooperate with China closely to push for more fruits from the LMC as well as sound and steady development of the ASEAN-China relations.